This article is about the island. For the town, see Ibiza (town). For the car, see SEAT Ibiza. For other uses, see Ibiza (disambiguation). Ibiza (Catalan: Eivissa [əjˈvisə])[p] is an island in the Mediterranean Sea off the east coast of Spain. It is 150 kilometres (93 miles) from the city of Valencia. It is the third largest of the Balearic Islands, an autonomous community of Spain. 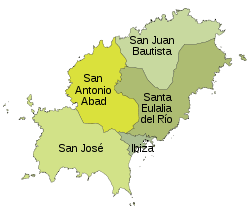 Its largest settlements are Ibiza Town (Catalan: Vila d'Eivissa, or simply Vila), Santa Eulària des Riu, and Sant Antoni de Portmany. Its highest point, called Sa Talaiassa (or Sa Talaia), is 475 metres (1,558 feet) above sea level. 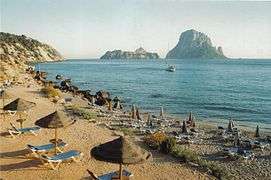 Ibiza has become well known for its association with nightlife, electronic music that originated on the island, and for the summer club scene, all of which attracts large numbers of tourists drawn to that type of holiday. The island's government and the Spanish Tourist Office have been working to promote more family-oriented tourism. The official name of the island is in Catalan "Eivissa" (pronounced: [əjˈvisə]). Its name in Spanish is Ibiza (pronounced: [iˈβiθa]). In British English, the name is usually pronounced in an approximation of the Spanish /ɪˈbiːθəˌ ɪˈviːθə/, whereas in American English the pronunciation is more anglicized, or closer to Latin American Spanish (/ɪˈbiːzə/, /iːˈbiːsə/). The origin of the island's name is in the Phoenician language Yibosim. In the 18th and 19th centuries the island was known to the Royal Navy as Ivica. 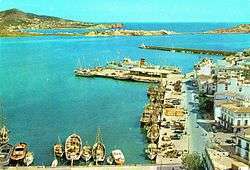 In 654 BC, Phoenician settlers founded a port in the Balearic Islands, as Ibossim (from the Phoenician "iboshim" dedicated to the Egyptian god Bes). It was later known to Romans as "Ebusus". The Greeks called the two islands of Ibiza and Formentera the Pityûssai (Greek: Πιτυοῦσσαι, "pine-covered islands"). With the decline of Phoenicia after the Assyrian invasions, Ibiza came under the control of Carthage, also a former Phoenician colony. The island produced dye, salt, fish sauce (garum), and wool. A shrine with offerings to the goddess Tanit was established in the cave at Es Cuieram, and the rest of the Balearic Islands entered Eivissa's commercial orbit after 400 BC. Ibiza was a major trading post along the Mediterranean routes. Ibiza began establishing its own trading stations along the nearby Balearic island of Majorca, such as Na Guardis, where numerous Balearic mercenaries hired on, no doubt as slingers, to fight for Carthage. During the Second Punic War, the island was assaulted by the two Scipio brothers in 209 BC but remained loyal to Carthage. With the Carthaginian military failing on the Iberian mainland, Ibiza was last used by the fleeing Carthaginian General Mago to gather supplies and men before sailing to Minorca and then to Liguria. Ibiza negotiated a favorable treaty with the Romans, which spared Ibiza from further destruction and allowed it to continue its Carthaginian-Punic institutions well into the Empire days, when it became an official Roman municipality. For this reason, Ibiza today contains excellent examples of late Carthaginian-Punic civilization. During the Roman Empire, the island became a quiet imperial outpost, removed from the important trading routes of the time. After the fall of the Western Roman Empire and a brief period of first Vandal and then Byzantine rule, the island was conquered by the Moors in 990, the few remaining locals converted to Islam and Berber settlers came in. Under Islamic rule, Ibiza came in close contact with the city of Dénia—the closest port in the nearby Iberian peninsula, located in the Valencian Community—and the two areas were administered jointly by the Taifa of Dénia. Ibiza together with the islands of Formentera and Minorca were invaded by the Norwegian King Sigurd I of Norway in the spring of 1110 on his crusade to Jerusalem. The king had previously conquered the cities of Sintra, Lisbon, and Alcácer do Sal and given them over to Christian rulers, in an effort to weaken the Muslim grip on the Iberian peninsula. King Sigurd continued to Sicily where he visited King Roger II of Sicily. The island was conquered by Aragonese King James I in 1235. The local Muslim population got deported as was the case with neighboring Majorca and elsewhere, and Christians arrived from Girona. 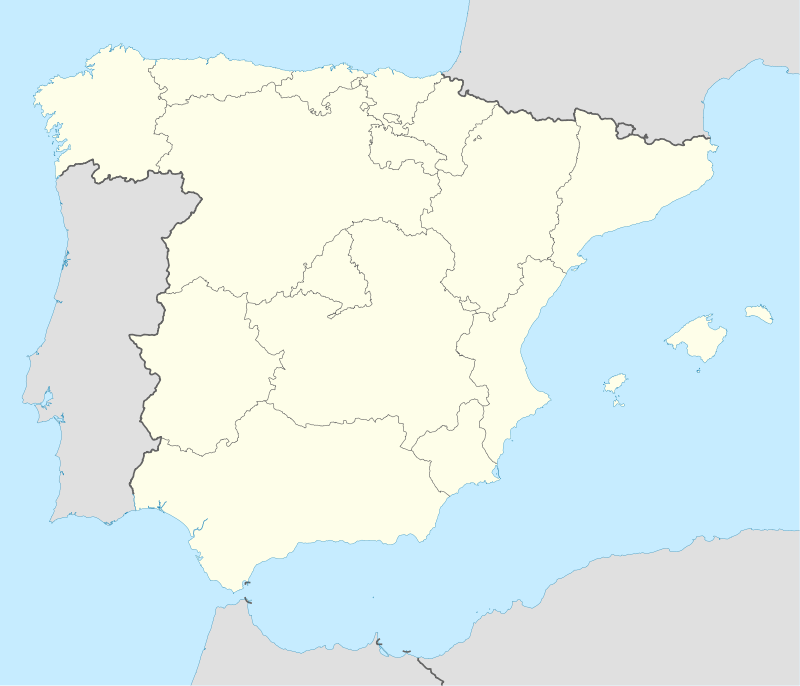 The island maintained its own self-government in several forms until 1715, when King Philip V of Spain abolished the local government's autonomy. The arrival of democracy in the late 1970s led to the Statute of Autonomy of the Balearic Islands. Today, the island is part of the Balearic Autonomous Community, along with Majorca, Minorca, and Formentera. Ibiza is the larger of a group of the western Balearic archipelago called the "Pityuses" or "Pine Islands" composed of itself and Formentera. The Balearic island chain includes over 50 islands, many of which are uninhabited. The highest point of the island is Sa Talaiassa, at 475 metres (1,558 ft). At the 2001 census these municipalities had a total population of 88,076 inhabitants, which had risen to an estimated 132,637 by the start of 2010, and have a land area of 572.56 km2 (221.07 sq mi). The summer climate of Ibiza typically ranges in the upper 20s °C (70s–80s °F), often reaching 30.0 °C (86 °F), with overnight lows below 22.2 °C (72 °F). The winter, off-season temperature reaches lows of 8.1–14.2 °C (46.6–57.6 °F), with highs in the upper-teens °C (60s °F). On average it snows once every ten years. Demographically, Ibiza displays a very peculiar configuration, as census agencies diverge on exact figures. According to the 2001 national census, Ibiza had 88,076 inhabitants (against 76,000 in 1991, 64,000 in 1981, 45,000 in 1971, and 38,000 in 1961). However, two years later, this figure jumped to 108,000 (Govern de les Illes Balears – IBAE 2004), and by the start of 2010 had reached 132,637. This rapid growth stems from the amnesty which incorporated a number of unregistered foreign migrants. 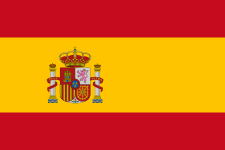 In terms of origin, about 55 percent of island residents were born in Ibiza, 35 percent are domestic migrants from mainland Spain (mostly working-class families from Andalusia, and the remainder from Catalonia, Valencia and Castile), and the remaining 10 to 15 percent are foreign, dual and multi-national citizens of the EU and abroad (Govern de les Illes Balears – IBAE 1996). In decreasing order, the most commonly visiting foreigners are German, British, Latin American, French, Italian and Dutch, in addition to a myriad of other nationalities. This mosaic reflects the fluidity of foreigners living and moving across the island, in ways that render impossible to exactly quantify the expatriate population (Rozenberg 1990). The Spanish composer and music theorist Miguel Roig-Francolí was born in Ibiza, as was the politician and Spain's former Minister of Foreign Affairs, Abel Matutes. Notable former residents of Ibiza include: English punk musician John Simon Ritchie (Sid Vicious), the psychedelic rock band Philiac, comic actor Terry-Thomas, Hungarian master forger Elmyr de Hory, American fraudster Clifford Irving, and film director/actor Orson Welles. Eivissenc is the native dialect of Catalan that is spoken on Ibiza and nearby Formentera. Catalan shares co-official status with Spanish. Additionally, because of the influence of tourism and expatriates living in or maintaining residences on the island, other languages like German, English and Italian, are widely spoken. Polylinguality is the norm, not the exception. 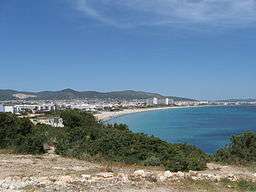 Ibiza is considered to be a popular tourist destination, especially due to its legendary and at times riotous nightclub based nightlife centred on two areas: Ibiza Town, the island's capital on the southern shore and Sant Antoni to the West. Well-known nightclubs are Privilege, Amnesia, Space, Pacha, Es Paradís and DC10. During the summer, the top producers and DJs in dance come to the island and play at the various clubs, in between touring to other international destinations. Some of the most famous DJs run their own weekly nights around the island. Many of these DJs use Ibiza as an outlet for presenting new songs within the house, trance and techno genres of electronic dance music. The city has achieved renowned worldwide fame as a cultural center for house and trance in particular, with its name often being used as a partial metonym for the particular flavor of electronic music originating there, much like Goa in India. Since 2005, the live music event Ibiza Rocks has helped to redefine the Ibiza party landscape. Bands such as Arctic Monkeys, Kasabian, The Prodigy, and the Kaiser Chiefs have played in the courtyard of the Ibiza Rocks Hotel. The season traditionally begins at the start of June with Space and DC10's opening parties and finishes on the first weekend of October with the Closing Parties. A typical schedule for clubbers going to Ibiza includes waking at noon, early evening naps, late night clubbing, and "disco sunrises." Due to Ibiza's notable tolerance toward misbehaviour from young adult tourists, it has acquired the sobriquet "Gomorrah of the Med." Also well-known is Café del Mar, a long-standing bar where many tourists traditionally view the sunset made famous by José Padilla, who has released more than a dozen eponymous album compilations of ambient music played at the location. 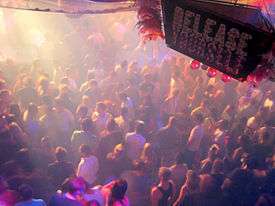 That and other bars nearby have become an increasingly popular venue for club pre-parties after sunset, hosting popular DJ performers. The island's government is trying to encourage a more cultured and quieter tourism scene, passing rules including the closing of all nightclubs by 6 a.m. at the latest, and requiring all new hotels to be 5-star. The administration wants to attract a more international mixture of tourists. A number of novels and other books have been written using Ibiza as the setting, including Joshua Then and Now by Mordecai Richler, Soma Blues by Robert Sheckley, Vacation in Ibiza by Lawrence Schimel, A Short Life on a Sunny Isle: An Alphonse Dantan Mystery by Hannah Blank, They Are Ruining Ibiza by A. C. Greene, and The Python Project by Victor Canning. 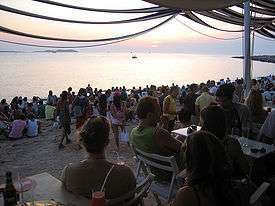 Ibiza is internationally known as the birthplace of Balearic beat music and its trance derivative. 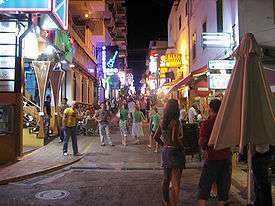 The song "We're Going to Ibiza" by Vengaboys featured the island's notorious nightlife as the ideal location for vacations. Swedish House Mafia has a song called "Miami 2 Ibiza". Approaching Nirvana has a song named "I Dream of Ibiza". The 1969 film More was filmed on location in Ibiza, and the soundtrack by Pink Floyd features a song titled "Ibiza Bar". German luxury fashion house Escada had a fragrance called Ibiza Hippie (in 2003 but now discontinued). Kevin & Perry Go Large is a 2000 British teen comedy film about a teenagers' summer trip to Ibiza, starring Harry Enfield, Kathy Burke, Rhys Ifans, written by Dave Cummings and Harry Enfield, and directed by Ed Bye.he movie also features the island's famous club Amnesia. "I Took a Pill in Ibiza" is a song by Mike Posner that recounts his feelings on his previous fame and the life of a musician. "Ibitha" is a song by The Lonely Island featured in their 2016 film Popstar: Never Stop Never Stopping. Though primarily known for its party scene, large portions of the island are registered as UNESCO World Heritage Sites, and thus protected from the development and commercialization of the main cities. A notable example includes "God's Finger" in the Benirràs Bay as well as some of the more traditional Ibizan cultural sites such as the remains of the first Phoenician settlement at Sa Caleta. Other sites are still under threat from the developers, such as Ses Feixes Wetlands, but this site has now been recognised as a threatened environment, and it is expected that steps will be taken to preserve this wetland. Since the early days of mass tourism on the island, there have been a large number of development projects ranging from successful ventures, such as the super clubs at Space and Privilege, to failed development projects, such as Josep Lluís Sert's abandoned hotel complex at Cala D'en Serra, the half-completed and now demolished "Idea" nightclub in Sant Antoni, and the ruins of a huge restaurant/nightclub in the hills near Sant Josep called "Festival Club" that only operated for three summer seasons in the early 1970s. In 2013, Ibiza property prices generally remained above market value, and many of the development projects on the island have now been completed or continue, as well as some new projects announced at the end of 2012. Since 2009, Ibiza has seen an increase in tourist numbers every year, with nearly 6 million people traveling through Ibiza Airport in 2012. 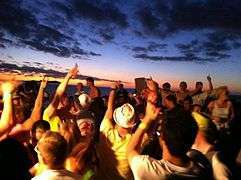 The summer season has become concentrated between June and September, focusing on the "clubbing calendar" which is currently booming. In recent years, the luxury market has dramatically improved, with new restaurants, clubs, and improvements to the marina in Ibiza Town. Ibiza's increased popularity has led to problems with potable water shortages and overrun infrastructure. This has led to imposition of a "Sustainable Tourism Tax" which went into effect in July 1, 2016. Minister of Tourism Vincente Torres stated in an interview in 2016 that the government has instituted a moratorium and building in certain areas. 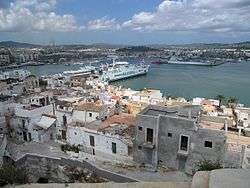 He said that with almost 100,000 legal touristic beds and about 13,000 inhabitants on the island's 572 square kilometres (221 sq mi) not much more tourism can be supported. Several public busses also travel between Sant Antoni and Ibiza Town—every 15 minutes in summer and every half-hour in winter. In addition, there are buses from Sant Antoni to Cala Bassa, Cala Conta and Cala Tarida, and to the Airport. 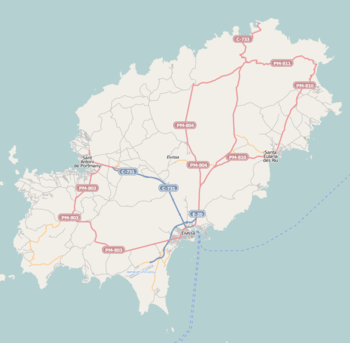 From Ibiza there are buses to the Platja d'en Bossa, Ses Salines, the Airport, and Santa Eulària. 1 2 3 Armstrong, Stephen (2006-07-01). "Ibiza unplugged". The Guardian. London. Retrieved 2010-05-04. ↑ Jones, Daniel; Peter Roach; et al. (2003). English Pronouncing Dictionary (16th ed.). Cambridge: Cambridge University Press. ↑ Wells, John C. (2000). Longman Pronunuciation Dictionary (2nd ed.). Harlow: Pearson Education Limited. ↑ "Ibiza Literature,Literature in Ibiza". Liveibiza.com. Retrieved 2013-03-26. ↑ Strab. xiv. p. 654; Plin. l. c " The Rhodians, like the Baleares, were celebrated slingers"
Sil. Ital. iii. 364, 365: " Iam cui Tlepolemus sator, et cui Lindus origo, Funda bella ferens Balearis et alite plumbo. " (Latin). ↑ "Valores climatológicos normales. Ibiza, Aeropuerto". March 2016. ↑ "Valores extremos. Ibiza, Aeropuerto". March 2016. ↑ Enciclopèdia d'Eivissa i Formentera. "Roig-Francoli Costa, Miguel Angel"
↑ Who's Who at NATO. "Abel Matutes"
↑ "Introduction to Ibiza". Frommer's. 2006-11-20. Retrieved 2010-05-04. ↑ Robbins, Tom (2007-11-18). "Is the party over in Ibiza?". The Guardian. London. Retrieved 2010-05-04. ↑ "Is Ibiza changing??". Bbs.clubplanet.com. Retrieved 2013-03-26. ↑ Sheckley, Robert (1997). Soma Blues. New York: Forge/Tom Doherty Associates. p. 222. ISBN 0-312-86273-3. ↑ Schimel, Lawrence (2003). Vacation in Ibiza. Eurotica. ISBN 1-56163-377-1. ↑ Blank, Hannah (2002). A Short Life on a Sunny Isle: An Alphonse Dantan Mystery. New York: Hightrees/Prism Corporation. p. 221. ISBN 0-9652778-4-4. ↑ Greene, A. C. (1998). They Are Ruining Ibiza. Denton, TX: University of North Texas Press. p. 123. ISBN 1-57441-042-3. ↑ Canning, Victor (1967). The Python Project. London, UK: Heinemann. p. 284. ↑ "Ibiza Hippie by Escada (2003) – Basenotes Fragrance Directory". Basenotes.net. Retrieved 2013-03-26. ↑ "Ibiza Party". TravelnTourism. Retrieved 2016-06-18. ↑ "Clubbing calendar", Ibiza-spotlight.com, August 2013. ↑ "Ibiza – a hedonist's paradise whatever your poison". Ibiza Traveller. Retrieved 6 July 2014. 1 2 Shortlidge, Chadler (17 July 2016). "Ibiza "Cannot Support Much More Increase in Tourism" Says Govt". Pulse. Retrieved 23 July 2016.